The following is a trip report from one of our AAC Nikwax Alpine Bellwether Grant recipients, tasked with researching the effects of climate change in high alpine environments. Glaciologists have stated for some time that glacial mass recession may be a decisive indicator in our understanding of climate change. Whether receding, relatively stable or, in some cases, increasing in mass, glaciers will help paint a global picture of just how and why climate change is occurring in different areas. Glaciers may also help us decipher the amount, changes and geographic extent of urban air quality and annual greenhouse gas levels – glacier ice and surrounding snowfall collects and traps this data as particulate matter from nearby urban areas. Beyond climate change indicators, glaciers are the primary source of drinking water for places like Santiago, Chile, home to over 5 million people, and are of utmost importance for the country’s agriculture, mineral extraction and hydroelectric power generation. The discussion of water rights and pricing under an increasingly strained resource scenario will also keep glaciers center stage. How we manage our most vital resource may thus determine community survival on many levels. 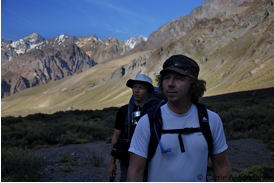 With the help of the American Alpine Club’s grants and support my team embarked on the journey of chasing some of Chile’s quickly melting glaciers to document any change in glacial mass recession over the decades. We were also tasked with focusing on any upward plant migration and animal sightings in the nearby areas to understand related environmental changes. For our first site visit, we hiked up the Juncal Valley in the Central Andes, through a Ramsar-designated “wetland of international importance” called Parque Andino Juncal, then just outside the park limits near the Argentine border. The Juncal Valley is lesser known to climbers outside Chile when compared to premier destinations like Torres del Paine, yet Juncal is a true gem, offering spectacular views of many summits throughout the trek. 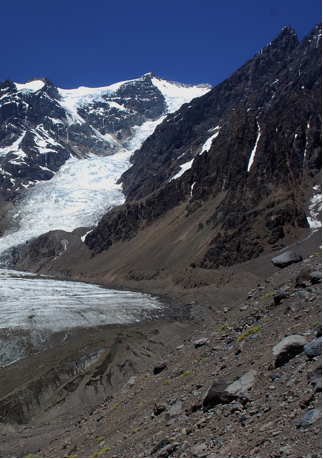 The Juncal Norte Glacier is a curvy tower of vertical ice that stretches thousands of feet and gives life to the Juncal River below. On our first day we hiked in and enjoyed a beautiful sunset over the surrounding peaks at camp. The next day we woke up early, crossed the freezing cold Monos de Agua stream that confluences with Río Juncal and made our way onto the edge of the glacier moraine for a first close up view of Juncal Norte’s vertical portions. After a short rest, we descended along the river, chose a feasible crossing point and forged Río Juncal to position ourselves for a repeat photo. 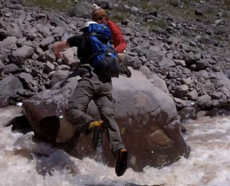 The force and speed of the river looked dangerous without trekking poles, so we decided to find a decent spot to jump between two boulders that challenged us with a torrent of raging ice water below. Brett took the first jump and found out that the landing rocks were indeed too slippery for a nice, sticky leap followed by a smooth landing. The distance between the lower and the upper rock was around a half body length and with no great “Plan B.” Good foresight on Brett’s part to frog leap and land splayed out just in case. My jump, with pack full of camera gear slowing my flight somewhat, ended in a less successful, gripping style frog jump. Brett caught my pack, then arm belayed me over the upper landing boulder. I then dragged my soaking right boot out of the water, and we hiked up about a hundred meters of scree with gear in hand to start shooting photos. We wanted to match our shots without delay and get back to avoid maximum river flux and volume. One of our potential matchup photos was taken by Javier Corripio as part of an international study conducted in 2006. Corripio had placed a digital camera at approximately (GPS S 70°07’ – W 58°28’) and set his apparatus to automatically fire once a day for a month. Javier and his team used this set of photos to process a stop action film of the glacier’s advance. Our second photo matchup was a 1959 photo taken by Ulrich Lorber. With the goal of taking shots from various angles and trying our sight methodology through GPS coordination and viewing older photos, we took a series of shots. Brett and I had to reach our GPS location, match up the frame as closely as possible, shoot in alternate locations to leave room for error, and make our way back down the west-facing scree slope for our return river crossing. By the time we had made it back to our river jump zone, our boulders were totally immersed and Río Juncal was wide awake at that point. Carrie had smartly stayed on our camp side in case we needed to figure another way out or had to change our plans and would need a strong anchor on the home side. After searching for other crossings together, we signaled our intentions to Carrie over the deafening rush of Río Juncal, then started to run upstream to where glacier meets river. We had seen that our only hope of getting back without traversing the slick moraine in crampons would be crossing near the river’s genesis where the crossing would hopefully be more shallow and thinner. If not, it would have been bivy time that night. The crossing near the start of the Río Juncal was indeed narrower, but the water was still rushing after having picked up full speed from its sub-glacial river source. Yet this was our best bet, so Brett took my Teva’s and crossed slowly and with sure feet. He made it across just fine only to find that the force of the current had ripped his left sandal tread off completely! Brett then launched my old, newly thrashed Teva’s back over to me – by then I knew the water was thigh deep, freezing and fast. I donned the sandals and planted my feet hard through the silted current to find rock below, gripping on large rocks and balancing against the steady current. I made it across safely, but my crossing shot the right Teva tread to join its left counterpart for a ride. All three of us finally crossed over the Monos de Agua stream, packed up camp and headed out of the park. 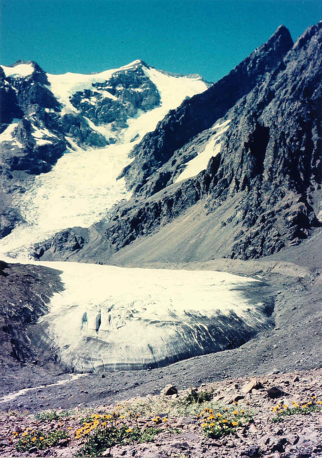 Specialists who have studied Juncal agree that this glacier is retreating. Its once grand, white tongue is now covered in dark rock and dirt, attracting intense South American sun with enough heat to drive its daily melt. 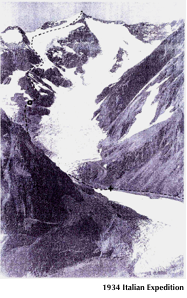 A 1934 photo taken during an Italian expedition indicates the more pronounced extent of Juncal’s edge; the 1959 photo taken by Ulrich Lorber shows a nice, mounded glacier tongue with some lateral moraine. We will continue searching for any old photos from earlier expeditions and I will return to Juncal to take more photos and film other interviews with scientists, park guards and fellow mountaineers. All told, I enjoyed taking a different approach during this expedition in admiring the glacier’s importance as a life source and eco-sentry, instead of just viewing a glacier as an obstacle to reach the summit. We would like to thank the American Alpine Club and corporate partner, Nikwax, for their generous grants to start this project and the support of their staff; to Bryan Mark and Alfonso Fernández at the Byrd Polar Research Center for their advice and for serving as our research references; to Alvaro Vivanco at DAV for his time, expertise and for allowing me to peruse DAV’s photo archives and learn more about Chile’s inspiring climbing history; to the support of Parque Andino Juncal’s staff and its owner and manager, Catherine Kenrick, and for our discussion together with Pilar Valenzuela; to Rodrigo Jordan and Jon Bowermaster for their advice and encouragement as this project just gets started; and also to Javier Corripio for his photo and his help in approaching the photography aspects. Last but not least, thanks B and C for your help, good times and for taking such amazing photos!!! Categories: Environmental | Tags: American Alpine Club, Chile, climate change, glacial melt, glacier, Juncal Norte Glacier, Santiago | Permalink.